More than two months after a deadly earthquake, many Haitians remain in dire need of basics such as food. But U.N. official says, "The government of Haiti will be in the driver's seat"
New York (CNN) -- Haitians lack confidence that their government will be able to lead a multibillion-dollar earthquake recovery plan set to be hashed out Wednesday at an international donors' conference at the United Nations. In a survey of 1,700 Haitians conducted this month, a majority said they believe a partnership is needed between foreign governments, Haitian civil society and the central government in Port-au-Prince. "It's understandable that people feel anxious about their own governmental response," said Philippe Mathieu, country director of Oxfam-Quebec, part of the confederation of agencies that make up the global charity Oxfam International. Oxfam funded the poll conducted by an independent Haitian polling consultant in several neighborhoods of earthquake-ravaged Port-au-Prince and farther west in Léogâne. "The international community should do everything it can to help the Haitian government back on its feet," Mathieu said. "There can be no durable reconstruction without the government." Ahead of the all-important donors' conference in New York, Edmond Mulet, the head of the U.N. Stabilization Mission in Haiti, emphasized that in the past, the international community has tended to bypass Haitian government institutions because of their perceived -- and real -- weaknesses. But this time, Mulet said: "The government of Haiti will be in the driver's seat." January 12's deadly earthquake killed more than 200,000 people and severely affected the lives of 3 million more. Many are homeless and in dire need of food, clothing, shelter and health care. The Haitian government's assessment puts the need for its battered nation at $11.5 billion. About $4 billion of that will be needed for recovery efforts over the next 18 months and will be administered by an interim reconstruction commission. More than 100 donor nations are attending Wednesday's fundraising session chaired by U.N. Secretary-General Ban Ki-moon and U.S. Secretary of State Hillary Clinton. The conference will be co-chaired by the leading donors to Haiti: Brazil, Canada, the European Union, France and Spain. "That is our challenge in New York -- not to rebuild but to 'build back better,' to create a new Haiti," Ban wrote Monday in The Washington Post. Haitian President René Préval will outline a recovery plan, which includes investments in schools, hospitals, roads and ports to redesign Haiti and put it on a path to growth and modernization, Mulet said. After the initial aid period, more money will be needed to support the government's ambitious renewal plans, Mulet said. In the Oxfam-sponsored survey, 26 percent of Haitians said jobs were the most pressing need, followed by schools (22 percent) and homes (10 percent). "Haitians are telling us loud and clear that they want to get back on their feet and start working for the reconstruction of their country," said Marcel Stoessel, chief of mission for Oxfam in Haiti. More than 70 percent of respondents praised the actions of foreign governments after the earthquake, and more than 60 percent approved of the aid distribution by global charities. 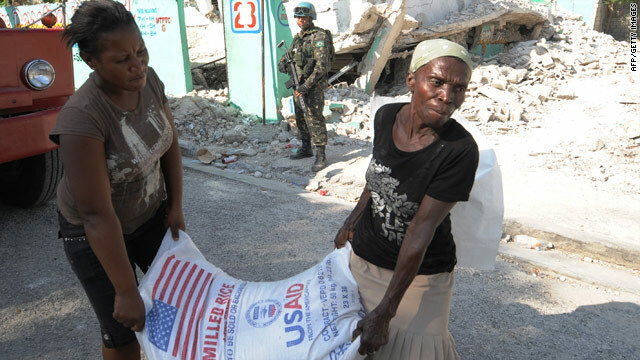 Even as donors venture forth on an ambitious path to recovery, Mulet warned Haiti's humanitarian emergency is far from over. The rainy season is on its way, and hundreds of thousands of Haitians are still living in makeshift tents. CNN's Moni Basu contributed to this report.